Characterized by their questioning minds, students between the ages of six and twelve have the ability to abstract and imagine. Their moral and social orientation and their unlimited energy for research and exploration are hallmarks of this Plane of Development. 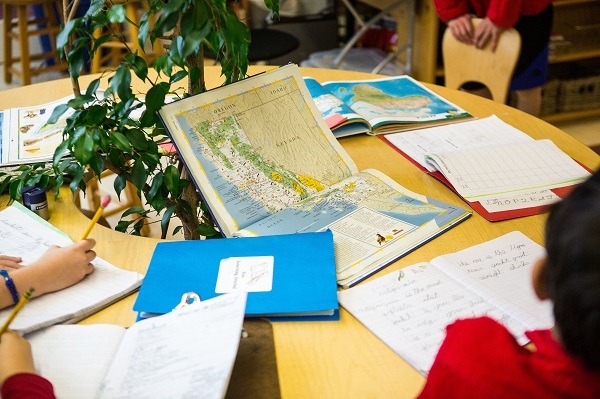 In a research style of learning, Elementary students work in depth on expansive projects that spark the imagination and engage the intellect. Lessons given by a trained Montessori teacher direct the students toward pursuits which help them to develop reasoning abilities and learn the arts of life. Children at this age are driven to understand the universe and their place in it. Their capacity to assimilate all aspects of culture is boundless. Elementary studies include geography, biology, history, language, mathematics, science, music and art. Studies are enriched through trips outside the classroom to community resources, such as the library, a planetarium, a botanical garden, local businesses or community centers, galleries and museums. A Montessori education fosters a feeling of connectedness to humanity, and inspires the child’s natural desire to build positive relationships and make contributions to the world. "I can only describe the Montessori influence upon my daughter as inestimable. Her "loving to learn" and her respect for learning are a direct result of her time at The Montessori School. There is never a moment when I haven't recognized the influence of Montessori on the culture of our family, but most often I see it when my daughter and I are talking about a book, play or film.